Our West-coast heartthrob and sleeping beauty duo built a team a generation apart. You have the younger with Matt Harvey and the elder with Adam Wainwright. Carlos Correa & Maikel Franco are up and coming and there is Melky Cabrera & Hunter Pence, good yet declining. Seems like a good balance of young and old. Also a good balance of hitters and pitchers. I was never likely going to like the Carlos Correa winner. He’s awesome. He’s a stud. But a lot of that value is relative to the position he plays. That counts, stretching last season to a full MLB season, Correa probably finds himself as a top 30, maybe top 20 hitter. If Correa is the best short stop, finds himself a standard deviation or two above the rest of the short stops, that $81 price tag is worth it. But to be a value at that price, he really needs to sneak into the top 15 or better of hitters. Blake Swihart & Yadier Molina are a great catcher platoon. Jose Abreu is great. Melky, Lorenzo Cain and Pence in the OF is pretty good. This team’s 3B situation is solid. In my opinion HLR doesn’t have “set and forget” utility hitters and that’s where his hitters goes from good to alright. Cycling just one of those spots is ideal. Matt Harvey is really good. Adam Wainwright is awesome according to my wife. Garrett Richards and Yordano Ventura look like aces on their MLB teams which is a plus in head-to-head. The top half of the rotation is really good. The bottom half is a few wishes and a prayer or two. Kevin Gausman is an enigma of sorts. What is Baltimore doing with him? If he gets to 160 innings as a SP, a solid value find. If he is in the bullpen or worse, just not pitching…yikes. The others could be good or great, or useless. Kris Medlin is drawing excitement in Kansas City, but I need to see 100 innings first. 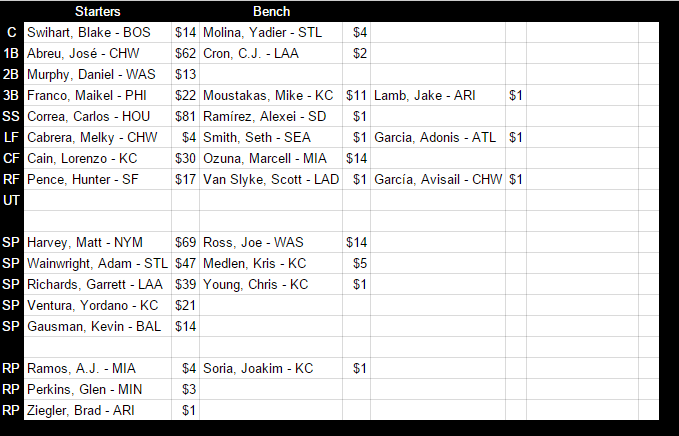 The bullpen here is okay, HLR seemed to find some decent relievers at a good price. The depth is not scary bad, in some areas it is quite good. I mentioned the catching platoon. Moustakas as your backup at 3B/UT is good. Lots to hope for from Marcell Ozuna and Scott Van Slyke who may not start for their MLB teams. The pitching depth as mentioned already is unreliable. The good thing about the depth is that it didn’t cost them too much. Shouldn’t be heart wrenching to replace a few of these back of the auction grabs if necessary. Hustle Loyalty and Respect could probably lose one or two of their big four starting pitchers and still be good. This team will ride and die with Carlos Correa. They paid for that spread from the short stop position. If Correa is as good as last year, probably need not worry. But, if he’s out for two weeks, how do you hold the fort down? Who’s stepping up? I don’t see it. Some fantasy pundits are calling Carlos Correa a top 5 hitter. If so he provides these guys with a devastatingly large 30-40 point advantage weekly over any other short stop. If Harvey, Wainwright and just one of Richards/Ventura all reach 1,000 fantasy points, you have a shot in each of the twenty week regular season. With the rest of the roster, either they stay healthy and/or HLR nails some transactions and this team would be on fire.